After working in the hospitality industry for 15 years, Nikole is finally pursuing her dreams of becoming a teacher. “It has always been my dream to become a schoolteacher. After leaving school at an early age, working in the hospitality industry for 15 years, and having a family, I finally decided to pursue my dreams. 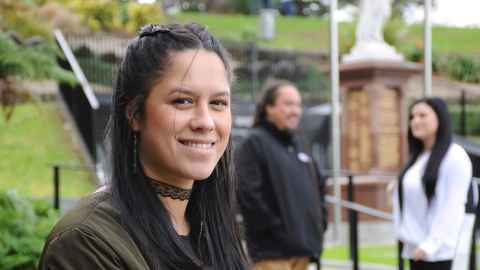 “Studying at the University of Auckland’s Tai Tokerau Campus ticked all the boxes for me. I liked the fact that I could stay in Whangārei while studying for my bachelors degree. The credibility of the University internationally is also a big plus. And the best part was being able to study in a Huarahi Māori environment. “I love learning and opening my mind to new and old things. I enjoy being among other students who have new and exciting ideas to add to my way of thinking.